[B] continued to push higher, but not beyond the end of a. It also now shows a clear three waves up, bolstering our current view. 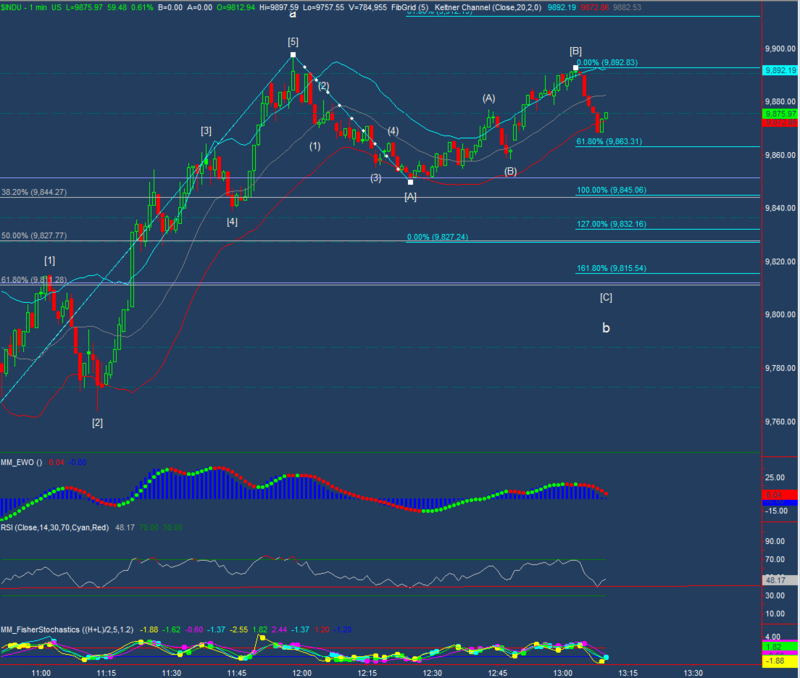 If [C]=[A] then we should see b end around 9845, roughly the 38% retracement of a. 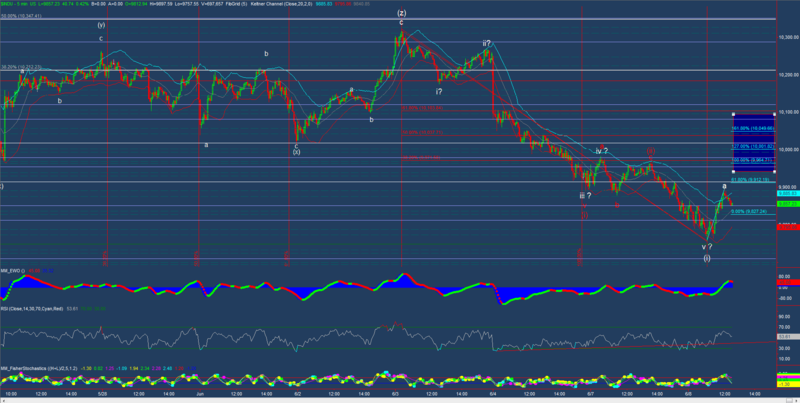 [C] = 1.618[A] is at 9815 nearby the 61.8% retracement of a, which sits at 9811. Given the size and shape of the move down so far, the latter is likely a better target. All of this asusmes our presumed wave count is correct. If this count is anywhere near correct, it’s straining the bounds with the Dow at about 9790 and the 76% retracement of a. There’s no new chart to accompany this update. But prices need to turn up here or we need to re-assess our count. Digging into one minute charts doesn’t always show clear wave structure, but when it does it you would like to see it conform to your market expectation or otherwise use it as a hint to look for other possible scenarios. We have clear waves on from our morning low that tentatively carries the label (i) and so far price action supports a correction underway. We can count 5 waves up into a, then 5 small waves down into [A] of b. A possible 3 three waves up into [B] of b are developing but are currently testing the timits. Should [B] be contained and end in three waves, it will continue to support our outlook. White Over Red? Is This Our Correction? Before being sold off to new lows, Monday saw and intraday rally off of from new lows. As if following the same scrrpt, new lows on Tuesday were met by buyers who stepped up late morning. Only time will tell if sellers rehearsed their lines and are ready for an encore after the lunch hour. If this bounce isn’t sold immediately, then we should be able to mark a wave (i) complete at morning lows and begin our search for the end of (ii) for resumption of the downtrend. Seeing indications that b of (ii) is complete would build confidence in the count and help us find likely targets for the end of (ii). That would leave us relying on the white count from Monday evenings issue of The Standard Deviant. For now, the blue rectangle provodes a wide range of possibilities. Particular areas of interest are 9915, 9954, 9978, and 10017. We keep wondering when and if we’ll get some sort of a corrective bounce and from what levels. Tuesday morning action is seeing bounces from new lows. The leading industrial group? Basic Materials. Check out the daily chart. We’ve seen our leader… it’s a dead cat bouncing. Daily Update: Did We Think Things Were Murky for Monday? Well… Monday did little to answer the question of when we’ll get a counter-trend bounce or whether we’ve already seen it. However, it did help reinforce our stated belief that the dominant direction is down. We’ll keep at it by looking for the setups that are working in this environment while we wait for the big wave 3 to show itself. As always, market outlook and new trade ideas are in the daily issue of The Deviant Standard (PDF). Our weekend supplement (PDF) outlined the case supporting our view that the general price trend for US stocks is now down. Our model portfolio remains completely short, although we took some partial profits on Friday. The short-term Elliott Wave count remains murky so we have little confidence that we know what will happen intraday on Monday or Tuesday. 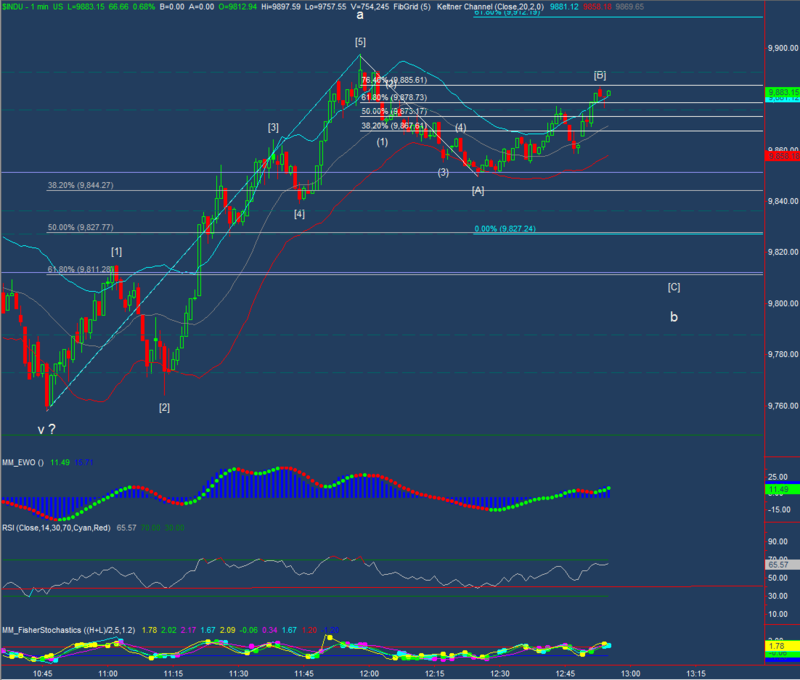 However, we’re confident enough in the general trend to be looking to put our profits back to work on the short side. The game plan and stock picks are all in the Monday prep edition of The Deviant Standard (PDF). There were many good short side opportunities last week, but many of them have already started to run and we don’t want to chase. Hopefully you caught some of them! If not, there are more good setups this week. ALNY is one to watch to see how it develops. From the weekly chart we can see that this stock is testing horizontal support established back in 2007 as well as descending trendline resistance. One of these will have to give way soon since the two are about to cross. The challange is figuring out which. The daily chart provides some clues. First is that volume has been heaviest on the downside for the past several weeks, with bounces occurring on light volume. The most recent bounce from trendline support was contained by the 20 day SMA and both our CCI-based and stochastics-based snapbackindicators are showing the likelihood of a snap back down. If it materializes, then trendline support should break and ALNY should go to new multi-year lows. This is consistent with our overall market forecast. 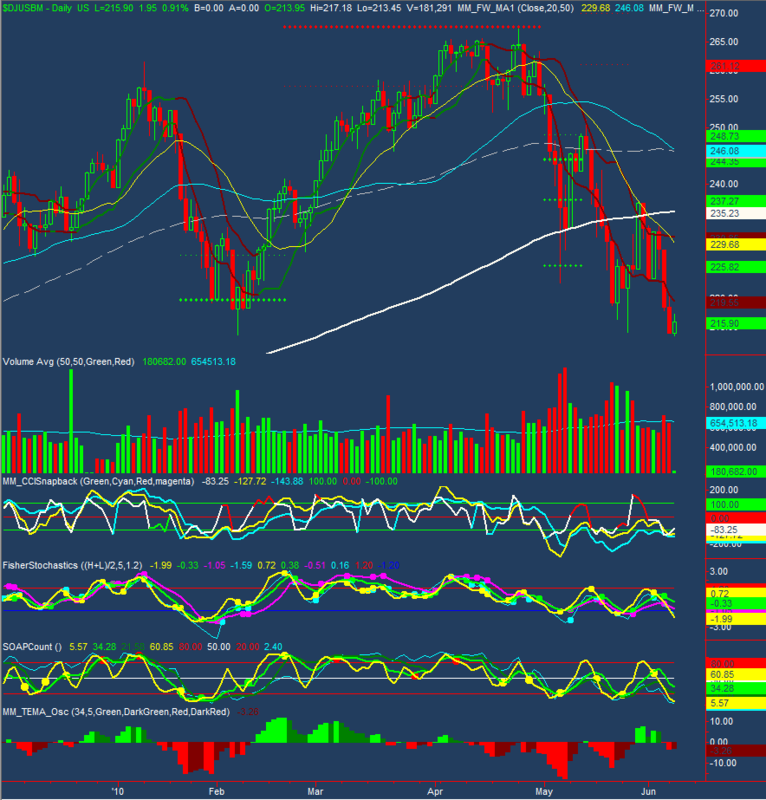 Short it against the 20SMA with a stop above either June 3rd highs, the 20 SMA, or the descending trendline. The risk here is a that a big pop takes you out with some slippage. Short a break of horizontal trendline support. The risk here is a big drop that leaves you behind. If so, you might want to wait to see if it retests support from below. ALNY has very high short interest, so a pop could be big. Be careful! It may also be hard to borrow from your broker. Options do trade on ALNY so puts are an possibility, but they are thin. The Deviant Standard should have many more good short ideas this week.